Carl & Carrie Butler have been cruising since 2006 aboard Brilliant, a 1989 Moody 425/ 42 ft. Sloop hailing from Green Cove Springs, FL, USA. They went up and down the eastern coast of the US, through the Bahamas and along the “thornless path” through the eastern Caribbean. Then through the western Caribbean, back to the States for a while, then the eastern Caribbean again. You can learn more about their voyage on their blog. They say: "We met online in 2004, married in 2006 and have cruised together continuously during our 11 year marriage. While we have owned 4 boats together, we have never owned a home on land together." As our cruising experience developed so did our needs and desires. The very first boat we owned, a 1977 37’ Irwin center cockpit was really a coastal cruiser and not suited for long range travel. In 2006 we purchased Sanctuary, a 1985 Soverel 41’ cutter rig that we knew was a proven blue water boat and enjoyed its performance through our first trip south to Trinidad in 2010. But the living space was thin and we developed “2 foot-itis”,wanting a larger vessel. 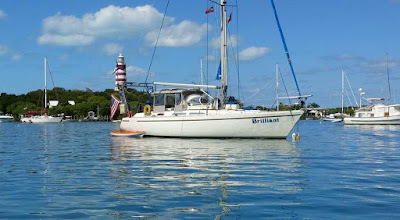 We purchased a 1979 Gulfstar 50 ketch rig in 2012 in St. Thomas that was a captain chartered boat in the BVI with minimum equipment onboard, and took 2 and a half years to outfit it for long range cruising, partly in the USVI and partly in Florida. On our trip to the western Caribbean we loved sailing the Gulfstar but unfortunately lost it to a reef in the San Blas islands, Panama in 2015. After a short stay on shore where we did some land travel, we felt the love of cruising pulling us back to the water and purchased Brilliant, the 1989 Moody 425 sloop rig in late 2015. 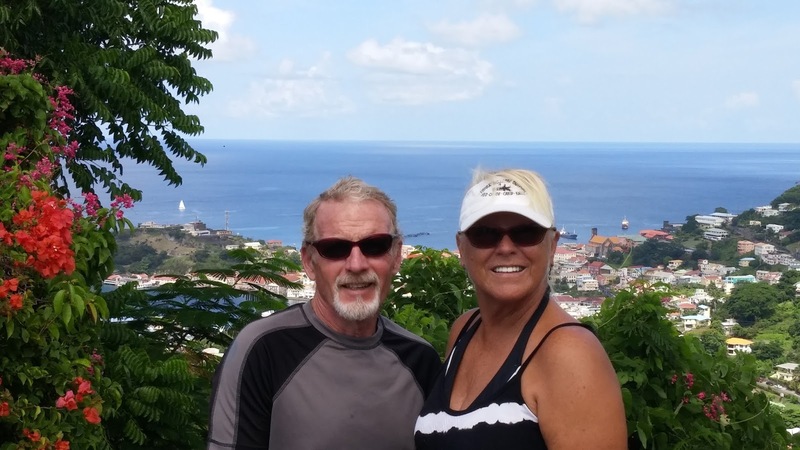 It was more fully equipped and allowed us to more quickly return to the Caribbean in 2016. We learned several axioms of cruising and boat ownership through this process. One, a larger boat has more room but higher cost. A larger boat is also more difficult for two people to handle, especially on offshore passages. However, the versatility of the ketch rig made the Gulfstar something we could sail by ourselves, even offshore. Finally, spending more money up front for a boat that already has cruising equipment installed as opposed to buying a boat cheap and installing everything yourself is not necessarily a good move; you don’t know the systems as well as if you had installed them yourself, and older systems need replacing more readily than new one. Sorry, can’t come up with anything on this. We are both prone to thoroughly research and analyze things that we are passionate about, and cruising is one of them. Before we started cruising, even before we met, we both had read everything about cruising we could get our hands on and talked to as many people in the field as we could corner long enough to answer a question. It was very exciting when we first met to find another person as stoked about going cruising, and it ramped up our relationship very quickly. Myth: Cruising is mainly lounging through the day off white sand beaches with calm blue waters and clear skies sipping Mai Tai’s. Truth: While we’ve enjoyed that, cruising truly is, as some wise soul put it, “repairs in exotic places”. The fun and sun is normally enjoyed as a break from the latest project or repair, which isn’t bad but the boat repairs always trump the snorkeling trips. Then there’s weather, which trumps everything. Along with those blue skies and calm waters we’ve experienced some extremely tough weather situations, both underway and at anchor. We are constantly watching the weather and the forecasts, and have more than once cancelled plans to stay with or return to the boat when a squall pops up. Dominica. The natural beauty of the island has been a siren’s call to us for many years, but until this year we have avoided going ashore because of security concerns with overly aggressive Boat Boys. We had a bad experience with one such individual in 2011 and have stayed clear until recently. With the development of PAYS in Portsmouth over the last several years, we have finally been able to fully enjoy what the island and its generally warm, friendly people have to offer. Good marketing practices have also spread to Roseau where we enjoyed an equally warm reception. In second place would be some of the French islands, Guadeloupe and Martinique. Their laid back attitude at Customs and warm friendly atmosphere always make us feel welcome. We’ve read that the difference between an experienced and an inexperienced Cruiser is that the inexperienced Cruiser is afraid to leave safe harbor for fear something will break and need fixing. The experienced Cruiser knows that things will break, plans accordingly, and leave the harbor for the next adventure. While we’ve had considerable trouble with overheating engines on this and our previous boat, there always seems to be something lurking out there waiting to break on us at the most inopportune time. It’s a juggling act, and you never seem to know what going to give you troubles next. Early on in our cruising we had a bad experience with a storm off the Florida coast while in or near the Gulf Stream. We didn’t check the weather well enough before going out and paid for it. Since then we have learned to be overly cautious and maintain proven sources of good weather forecasting. We have also learned to have the patience to wait for decent conditions. As a result we believe that some of the worst conditions we have faced have been at anchor. Specifically this season on two occasions we have experienced squalls during periods of light winds where the squall produced strong westerly winds with waves of long fetch in areas where there was nowhere to hide from westerly winds. In one case the best option turned out to be getting underway to ride out the resulting swells after the squall in deeper water. Have you ever felt in danger and if so, what was the source? After 11 years of cruising, living at anchor with our hatches open most nights, we have generally felt safe in most places until just recently. On one island we encountered an individual aggressively pestering us for “tips” in reward for “watching out dinghy”. We decided to stand our ground but afterwards felt the vulnerability of being alone at anchor off the beach. Perhaps we could have shrugged it off, but having read reports of assaults or even deaths experienced by other Cruisers in similar situations, we decided to leave the area that afternoon. We have also avoided some islands because of reports of boarding and assault perpetrated upon Cruisers by local individuals. “A place for everything and everything in its place.” There is nothing more frustrating than going to find something onboard, be it a tool to do a job or our sunglasses, and not being able to find it. While we are incredibly meticulous about lines in the cockpit coiled and neatly stowed or deck gear stowed neatly so it is ready to use at sea, we often search for tools and personal belongings for what seems like an eternity when we know that they are somewhere within 42 feet of us. What is your favorite aspect of Cruising? Two things are at the top of the list. One is traveling to and exploring new places. We both have a serious case of Wanderlust and after 11 years that hasn’t diminished a bit. This is a big world and there are still so many places to explore. We’re going to need lots of years to get to them all. The second is the Cruising Community. To us, Cruisers as a whole are some of the best people on earth. We have likened anchoring in a new place like a kid being let loose on a new playground. If we don’t know someone there already it never takes very long to meet someone new and start up a new friendship. If ever someone needs help and puts a call out on the VHF, it’s a sure bet that several will answer the call immediately, whether they know you or not. Need a tool? Need advice on a piece of gear? Need directions? Help is right there just waiting for your request. We’ve donated blood for a cruiser who needed it that we never met before and never got to meet, but heard later that they used the blood to help stabilize her until she could fly back to her home country for treatment. It feels good to know that you can find that kind of help wherever we are and whatever the situation.